AeonWave Support provides a number of graphical front-end applications. AeonWave Config is a graphical configuration utility to easily manage the default configuration for AeonWave. The program can be used to set the default input and output device, required mixer frequency and default refresh rate, the number of output speakers and select one of the output formats: stereo, spatial, surround sound or HRTF. It is also possible to choose between exclusive mode and shared mode operations if shared mode is supported by the backend. When in shared mode other applications are able to use the sound device simultaneously with applications that use AeonWave. 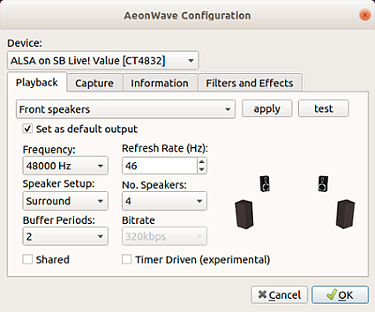 AeonWave Config can also be used to show the capabilities of the current version of AeonWave and of the specified sound device and backend.